Yup the sign was awesome. 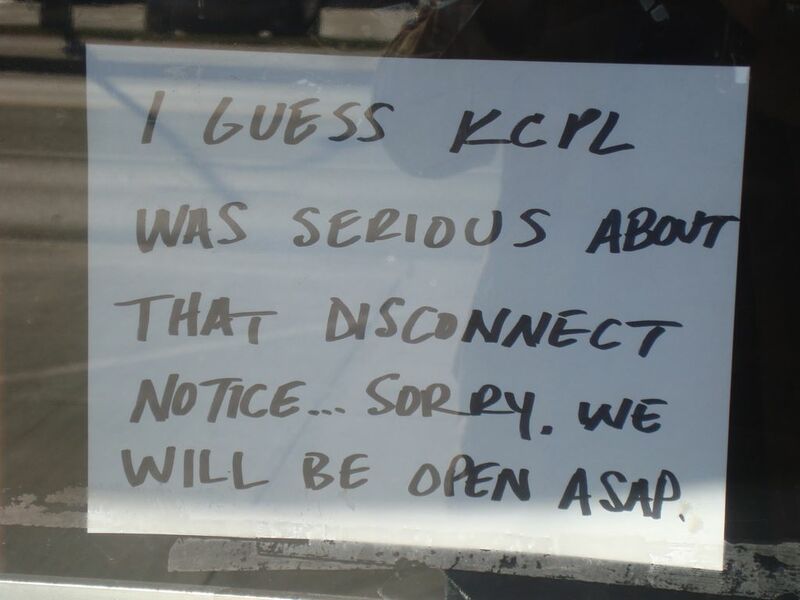 If you get shut down, you might as well have a sense of humor about it. So JJ’s Other Place was verklumpt. No matter, I knew my boy Jolly was at Lew’s (mainly because of his Big 10 love) so I tooled on over there to watch a game and enjoy the patronage. I’ve already talked about Lew’s and I can reiterate that they have it locked down pretty well for such a tight place. They really do offer alot in terms on diversity and alcohol. I was super close to trying the Apple Cinnamon Bourbon. But I didn’t have that drink. I needed to wash my sorrows with something that closely resembled the hole in the wall experience I craved from JJ’s. 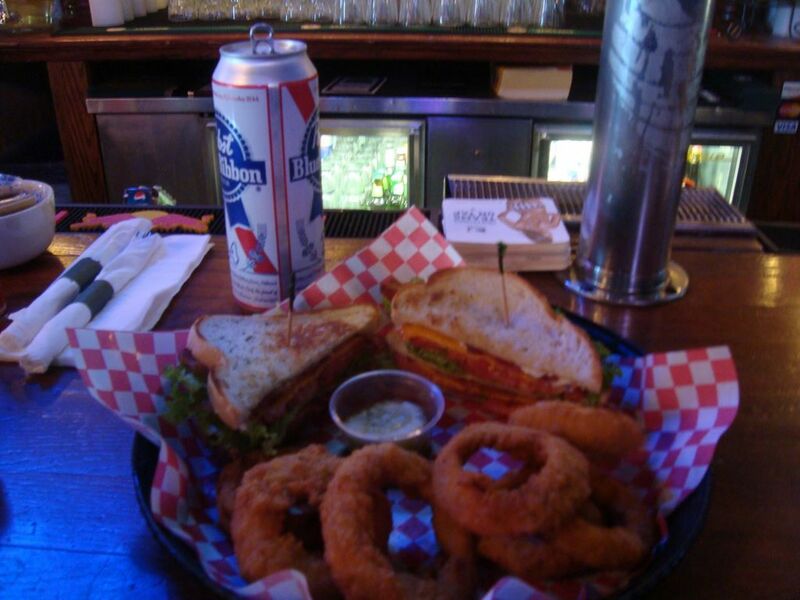 So I opted for the double BLT with a big ole 24 ounce Pabst’s Blue Ribbon can. Yes, it was all tasty and completely worth it. The onions rings were outta sight. The super thick batter complemented the multi layered ring inside. It’s tops in the city for me. PBR washed the dryness of the sandwich away and made bacon flavor just a bit more tangy. I didn’t eat for another 10 hours after I had the pairing. The early game, and really the only game, I wanted to watch was Kansas State vs Missouri. The drama around Cam Newton, which I talked about, wasn’t enough to compel me to check out the match up between Georgia and Auburn, plus the big night game slated was Oklahoma State heading to Austin to take on a quitter Texas team. I chose wisely. Well, at least in the first half. Kansas State showed up and had a great game plan installed to handle Missouri’s one-two attack, via the hands of Blaine Gabbertt. As I suspected, both Collin Klein and Carson Coffman got some time under center and had somewhat opposite effect against the Tigers. When the Wildcats needed to run, Klein was in. When the Wildcats needed to throw, Coffman was in. The big mistake was at the end of the first half when Coffman passed his way to the one yard line of Missouri and then fumbled the ball on the run. I knew then that the game was over and I wondered why Snyder didn’t go with the better running quarterback. All credit goes to Missouri for playing mistake free football. The one interception Blaine Gabbertt threw was off a tipped ball. Outside of that mistake, he ran and threw all over Kansas State. The offensive line of Kansas State also had a terrible time trying to handle the stud defensive linemen the Tigers threw at them.. One of the biggest plays of the game was Aldon Smith swinging around and knocking the ball out of Coffman’s hands for a fumble and defensive touchdown. That’s right Carson Coffman was responsible for a 14 point swing. But at least Kansas State beat the spread. I did not have any expectation of the Wildcats winning Saturday and I’m glad that it wasn’t a lack of offensive production that killed Kansas State. It was a slower defense that had a hard time with a better offense and a turnover margin of about 2 or 3. After that, my day was done. This was a weak barspot and I’m looking to redeem at JJ’s Other Place. Rivalry games are left so I know that the action on the screen will be better. Until then I’ll just bask in my short time at Lew’s with my bacon and PBR glow.